Maps of the Madrid subway lines, line by line, with extra info. Here is the map of Madrid subway lines, separated individually line by line. The following maps were updated on January 2019, as we have tried to be as accurate as possible. The above maps indicate the Madrid subway lines with stops with transfers to other public transports. 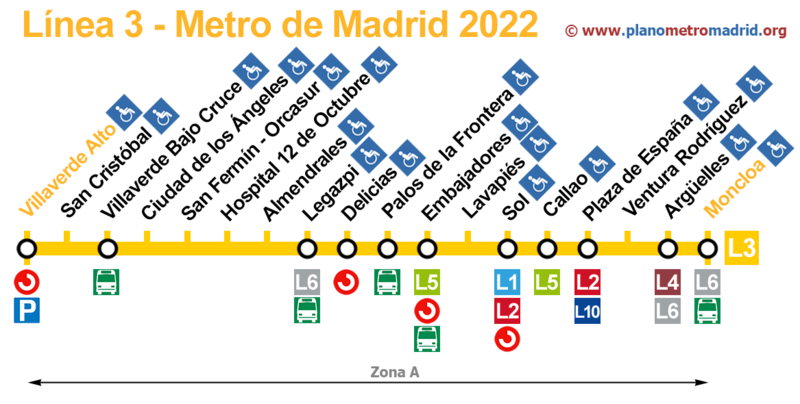 Note: It is necessary to add a comma after the destination entered: eg "Madrid", so the route can be calculated correctly (see the previous two examples). If you find any problems or incorrect information, please use our contact form so we can fix the problem ASAP. Thank you for visiting, we hope that our map of the Madrid metro system has been helpful to you.